When the translation of an Italian dish means “jumps in the mouth” you know you are likely in for a treat. Saltimbocca is just that – a dish that is so full of flavour your taste buds are likely to jump for joy. If you’ve had saltimbocca before, you probably think its a lot harder to make than it is. 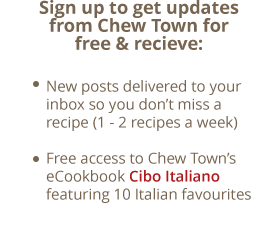 Which is why my recipe for Veal Saltimbocca is the focus of Chew Town’s second video which you can watch above or over on Chew Town’s YouTube channel. Sage leaves, prosciutto and veal form the basis of the dish’s flavour with butter, oil and white wine finishing it off beautifully. It takes about 15 minutes from cutting the veal to serving the dish and is the perfect midweek meal when you are time poor but need to make a good impression. Served simply with a rocket, pear and parmesan salad or a caprese stack, your taste buds will certainly thank you for making it. In other news, we have another Chew Town video produced and ready to go – this time for a traditional Italian biscuit – but are about to start working on the next set. I’d love to hear from you in the comments – what recipe/s would you like to see us tackle and why? Beat veal until flattened. Place a slice of prosciutto and a sage leaf on top of each fillet and secure with a toothpick or skewer. Over medium high heat melt butter and olive oil together in a large pan. Lightly dust the veal with the flour and place in the pan frying for 2 minutes before turning over to fry for another two minutes. Add the wine and simmer on low for 5-8 minutes. Remove the toothpick/skewer and serve pouring the sauce from the pan over the veal. Serve with an Italian leaf salad or these Caprese Stacks with Basil Oil. Love this dish! Both the recipe and the video are terrific. 😉 Thanks! Awesome video and audio! I always fold my veal over after filling it with prosciutto and sage. Is the way you’ve done it the more traditional method? Not that it matters when it comes down to taste. Thanks John. Not sure that it’s more traditional, its just the way we’ve always done it in our family. Not only do I love this post (plating, light, EVERYTHING!) Saltimbocca is one of my all time favorites! Congrats on the video post as well. New horizons! It’s such a great dish isn’t it! And so quick and easy. Thanks as always for your lovely words Kevin! Saltimbocca is one of my faves! And WOAH – what? Videos? Since when do you do videos!!! AMAZING! I just love it because it is so easy! Haha, yep just starting to do them. So. Much. Work! Stunning photos! Makes me want to go make it now, even though I have no veal and it’s 2am!! It’s really not very difficult and you are rewarded with beautiful tender meat. I love making Italian crumbed cutlets with it. That looks so yum! And what a great video! I love those plates! Where did you get them from? I actually got them in Italy a few years ago… Bizarrely I found them in a chocolate shop! I loved your video. This dish looks so yummy! I love your photos make this dish look so delicious and the video make the recipe seem so much easier to make. What a great post!